Nymphs for Streams and Stillwaters provides a sound understanding of the relationship between naturals and their imitations, and between those imitations and the trout. You'll learn what nymphs you should spend your time tying, you'll learn how to tie them, and most important, you'll learn where and how to fish them in order to catch more trout. Nymphs for Streams and Stillwaters is broken logically into four parts. The first part is an introduction to the way nymphing shapes itself with notes on streamside and lakeside observation, nymph selection based on what you observe, and recommendations on tools and materials for both basic and advanced methods for tying nymphs that take trout. 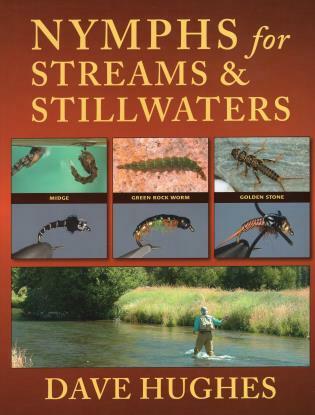 The second part deals with the selection and detailed tying of all sorts of effective searching nymph patterns for moving water. The third part examines imitative nymphs for moving waters, tightly relating naturals to their imitations. The fourth part covers stillwater nymphs. Trout are ore often selective in lakes and ponds, and the things they eat in stillwaters are often unlike trout foods in rivers and streams. Hughes takes a subject that has been considered complex and confusing and makes it understandable, presenting the information that you really need to improve your tying and your fishing. Nymphs for Streams and Stillwaters is destined to be the step-by-step reference to tying and fishing every nymph you'll ever need. Filled with good advice from a trusted master of the subject, it is the most thorough and enjoyable book about selecting, tying, and fishing nymphs that has ever been written.